Hey All! I've got a problem with these Suntour Power Shift levers. When I engage them to shift they ratchet right back into neutral position. every time. Anyone had any similar issues or know how to fix the problem? I'm guessing either the mechanism isn't working as intended and the ratchet is slipping, or something is backwards. You're supposed hear the ratchet when pulling against the spring. The spring in the derailer shouldn't be able to make ratchet sounds. Pulling on the cable from the derailer side should not result in ratchet noises, the ratchet should be engaged and the cable acting against friction. Hi! Yea the derailleur is not making the ratcheting noises. When I engage the levers to shift gears, they (the levers) are just ratcheting back to neutral. Is it the derailer spring pulling on the cable, and pulling the shifter causing the ratcheting noise? Basically, when you let go of the shifter, the shifter doesn't stay there and makes ratcheting noises when it moves after you let go? These shifters are designed to only make ratcheting noises when your hands are moving the lever. Is the lever slipping smoothly or ratcheting back? If they're slipping smoothly, there may not be enough friction in the shift mechanism. There needs to be sufficient friction to overcome the derailleur's return spring. If the derailleur's return spring wins that tug o' war, the shifter slips. To add friction and prevent the shift lever from slipping, tighten screw #16 in the diagram a little bit. If adding a bit of friction by tightening the screw doesn't fix the problem, the shifters may be assembled incorrectly or damaged. If the shifters are ratcheting backward, I suspect something might not be assembled correctly. okay! so yes! the previous owner had reassembled the levers on the wrong sides of the clamp which is why they were slipping when actuated and ratcheting in the wrong direction! thanks all. 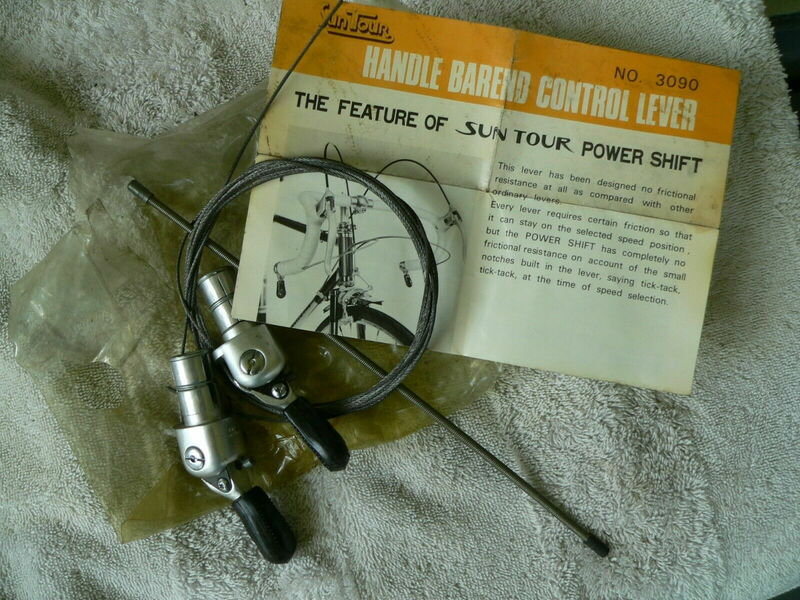 I've just bought what seem to be a set of NOS bar-end Power Shift levers. They were seized with the dried-out grease. When I clean and re-assemble them, what should be lubricated, ad what should not be lubriucated? Is there someone here who would want the original galvanized shifter cables? I'm planning on using modern stainless steel cables. If it's something else, try to explain more clearly. If you're going to post something like this, you should start your own thread. Replying to 3-year-old threads makes things very confusing. I would put a little light grease on the ratchet mechanism and some heavier grease on the threads and wedges of the expanding clamp.